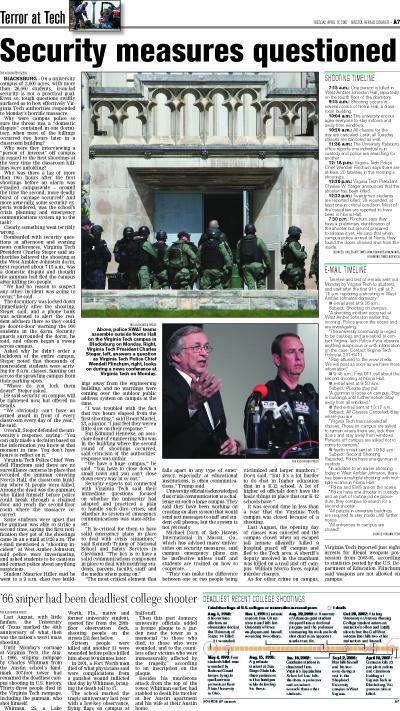 I&#39;m a copy editor and page designer at the Bristol (Va.) Herald Courier and I had the responsibility of putting together two full pages dedicated to Virginia Tech for the April 17 issue (this is the second page). I knew I was recording history, but after looking at so many photos and stories on the tragedy, I couldn&#39;t sleep that night. Mike Fox, “Terror at Tech II,” The April 16 Archive, accessed April 24, 2019, http://www.april16archive.org/items/show/115.